If you have news, a ride report, photos or anything to share with the BCI you can submit items by sending them to our Communications Coordinator. BCI has not raised it’s dues for many years - and at the February Board meeting a decision was made to increase dues to $25 per year per person effective April 1st. New prices will be on-line after that date. Members have the option of renewing early tor extend 1 year before the increase goes into effect. 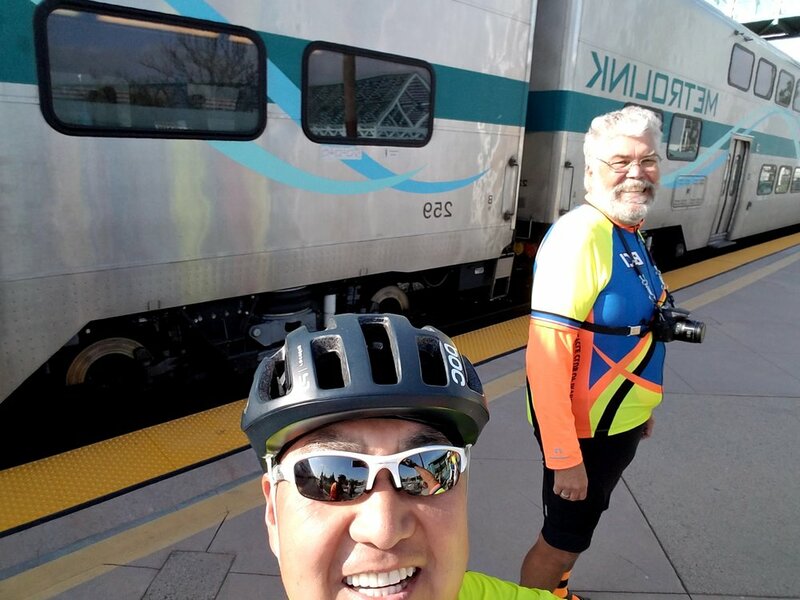 You can help ensure California’s streets are safe, comfortable, and attractive for cyclists and other road users of all ages and abilities. Senate Bill 127 would require major road projects to accommodate all road users, not just drivers. The California Department of Transportation would be required to follow its existing Complete Streets policy and include facilities for bicyclists and pedestrians, so that these improvements are the default rather than the exception. 1. Sign California Bicycle Coalition’s petition. 2. Contact your Senator and tell them to support SB 127. Complete Streets can transform our California communities into comfortable and convenient spaces for walking and bicycling. But it can’t happen without your support to show California lawmakers that this is an important priority for the state. Our Annual Meeting on January 19th was a wonderful gathering of members, acknowledgment of the 2018 Board, Appointment of the 2019 officers, and recognition of the Member of the Year ‘Spirit Award’ recipients. Outgoing President Mike Farrell, VP Laura Brown, Ride Coordinator Jim Norman and Statistician Randy Profeta officially handed over their posts to Marc Urias, Dave Murphy, Vince Wilhelm and Lindsay O’Neill. The other 5 officers volunteered to continue to serve in 2019. 2018 Directors at Large, Alex Lim, Monica McCarthy & Desiree Mathos were also thanked at the end of their service on the board. The Spirit Award for 2018 was a tie; Wayne Broadhag and Laura Brown were honored for their enthusiastic participation as members of the club. 80 members were in attendance and we enjoyed a delicious feast served up by Peppinos. Ryan Powell at Power Meter City (one of our generous sponsors) submitted this article of tips. See Power Meter City for their special BCI pricing on their line of high tech components. Whether it’s for a new hobby or a way to be more eco-friendly, taking up cycling or biking is a fantastic decision. Biking is an excellent cardiovascular workout that doesn’t strain your bones and muscles as much as other forms of exercises do. It also does wonders for your mental health, helping you destress, discover, and renew yourself. As a new cyclist, you must be eager to take out your new bicycle for a run. Before going out on your first run, though, you should equip yourself with the following essential biking gear to make your ride easier, smoother, and safer. Front and rear lights are absolutely essential for your bike. For one, they help you see where you’re going, especially if you’re riding through dim or unlit areas. Bike lights also help you avoid collisions with other vehicles. They make it easier for other road users to see you in the dark, thus avoiding driving too close or grazing your bike. Aside from bike lights, you should also have wearable light-up accessories, like a headlamp or a LED safety belt, to further increase your visibility on the road. Because you’re riding a smaller vehicle, it’s twice as important for you to visible on the road, especially one full of bigger and faster cars and trucks. No doubt about it—the city is full of questionable characters who won’t hesitate to take advantage of an unattended (and likely expensive) bicycle. Even leaving your bike for just a few minutes isn’t safe, especially in the metropolis. That’s why you should never forget to bring antitheft bicycle locks whenever you take your bike out for a ride. Don’t purchase just any lock. Thieves have many ways to open ordinary locks. There are different types of biking locks to suit your needs and to protect your bicycle. Ask for recommendations from fellow cyclists, especially experienced ones, and read product reviews before purchasing a bike lock. Never skimp out on your bicycle locks. And if possible, get two locks to double the security. You won’t have many problems with mud and puddles in the city. However, if you go riding in the wilderness or rural areas, you’re bound to encounter all kinds of rough roads. Equip your bike with mudguards or fenders to minimize the mess when you ride through boggy roads. Mudguards also protect you from getting splashed by water from your wheels when you ride through or after a rainy day. Most bikes usually have mounts to install mudguards, so all you need is to find fenders that fit your bicycle. You can’t predict when you’re going to have a flat tire. That’s why it’s always safe to carry your own tire pump wherever you go. Fortunately, you don’t have to suffer carrying a clunky air pump all the time as there are now portable models that are just about the size of a hand. Aside from a minipump, you should also bring a spare tube, a multitool, and tire levers, in case you meet a bigger emergency than deflated tires. Getting dust in your eyes while cycling can be dangerous, especially if you’re going fast. Wear a pair of sunglasses to protect your eyes from debris and stray bugs when you’re cycling. Having sunglasses on can also shield your eyes from the wind and the bright sun. When choosing your biking eyewear, make sure to keep considerations in mind, such as fit, grip, coverage and protection, and the weight of the material. A helmet is essential for every cyclist. Several cities don’t require cyclists to wear a helmet when they ride their bike outside, but that shouldn’t stop you from getting one. Over 1,000 people die due to bicycle-related accidents in the United States every year. In 2015, the US Center for Disease Control and Prevention recorded 467,000 biking-related injuries. Wearing a helmet can save your life and lessen your risk of getting fatally injured in a biking accident by 85 percent, says a case study by Bicycle Helmet Research Foundation. Unfortunately, cyclists are not weatherproof or accident-proof (no matter how much they want to be). As a cyclist, the best way you can protect yourself from unpredictable situations is to wear protective clothing or gear, such as a waterproof jacket, knee and wrist guards, and body armor (for adventure bikers). It’s not excessive to wear protective clothing, especially if you’re going to travel on unfamiliar terrain. When you’re adequately protected, you can be more worry-free and enjoy your biking adventure. While the things mentioned above are essentials, getting a power meter makes a difference in your biking adventures. When it comes to training yourself to become better at long-distance cycling or simply looking at useful data, this device will be beneficial in the long run. Power meters are compatible with most bikes, and they are easy to install, so you can use them right away. Cycling is a very healthy activity for both the rider and the environment. It allows the rider to reap a lot of benefits, chief of which is a healthier body and mind. Biking is also more eco-friendly and cost-effective. Before you go biking, make sure to prepare yourself for anything you may encounter through your journey. Equip your bike and yourself with the essentials, from bike accessories to body protection, to have a safe and worry-free ride. This will be my final communication as your President. After three years, I’ve decided I’m ready to step down. At age 77, and one of the club elders, I plan on just relaxing and enjoying riding as often as possible. Along with me, three other members will be stepping down from the BCI board. Laura Brown, my Vice President, Jim Norman, Ride Coordinator, and Randy Profeta, Statistian. Thanks also to Alex Lim, Monica McCarthy, and Desiree Mathos, who served as Directors at Large in 2018. They have all been major contributors to our club and my thanks go to all of them for all their efforts on our behalf. Those remaining on the board are Bob McHenry, Secretary; Steve Buescher, Treasurer; Deby Six, Membership; Jane Schreznel, Hospitality; and Bill Sellin, Communications. Working with you all has been an honor, and has made my job as President an easy and enjoyable task. Our new replacements have been nominated and will be elected at our Annual Meeting on January 19th. They are, Marc Urias, President, Dave Murphy, Vice president, Vince Wilhelm, Ride Coordinator, and Lindsay O’Neill, Statistician. Welcome to you all. And to all BCI members, I wish you safe and enjoyable riding throughout the coming year and I look forward to seeing as many of you as possible at our annual meeting and dinner coming up on the 19th. If you haven’t signed up yet I hope you do so this week. See you then. At our December General Membership meeting we were treated to home made holiday cookies (thanks Hospitality Director Jane Schrenzel!) and a very lovely sing along accompanied by President Mike Farrell on accordion and led by lyricist and conductor - Vice President Laura Brown. The sing-a-long was a lot of fun and here we share with you the special lyrics Laura penned, with a wish of a very happy holiday season and wonderful new year! It was a chance to give some Naughty & Nice Kudos / digs to each other - as well as share some resolutions to strive for in 2019. We also got to introduce 3 of the 4 new officers-elect who volunteered to join the Board next year ( Marc Urias, Dave Murphy & Lindsay O’Neill were there; Vince Wilhelm was absent) - and it was another chance to to give our thanks to outgoing President Mike, Vice President Laura and Ride Coordinator Jim Norman (we missed Statistician Randy Proffeta) It was a great addition to our holiday season! At our August General Meeting the OC Fire Authority paramedics spoke about the importance of having Medical Info available when they help you after a crash. The police may want a license for their report or a citation, but EMS needs to know about your health to treat you as well as possible. Paramedics will NOT call an 800 number off your Road-ID bracelet or be looking online for a coded ID tag on your shoe, which is why you also need a card containing critical emergency & medical information. (This is OC Fire Authority policy.) The hospital may call that 800 number or look up your web site if you are non-responsive, but a card in your tool bag, and another with your phone and a 3rd with your cash is where emergency responders (and fellow members on the scene) will look for your information. Without this readily available info on a card, precious aid-time could be lost. They NEED TO KNOW if you are on any medications that might conflict or be a problem with something they may treat you with - so List every prescription or list "None" so they know what to work with. That may ned to be updated every time you start or stop a treatment. They NEED TO KNOW if you have any medical allergies - or food allergies if it might explain your condition. Of course, we all hope to ride safely and in good health. But a little information card on your person could make a BIG difference! Are you a Chronic 'Edge Rider"? 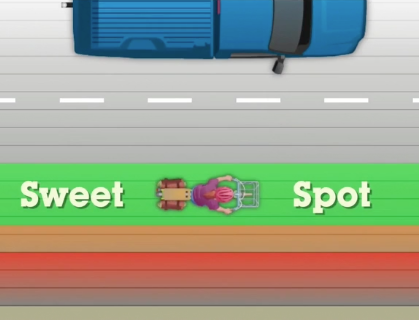 The Orange County Bicycle Coalition recently shared a great video explaining the dangers of riding on the edge of roads vs 'taking the lane'. 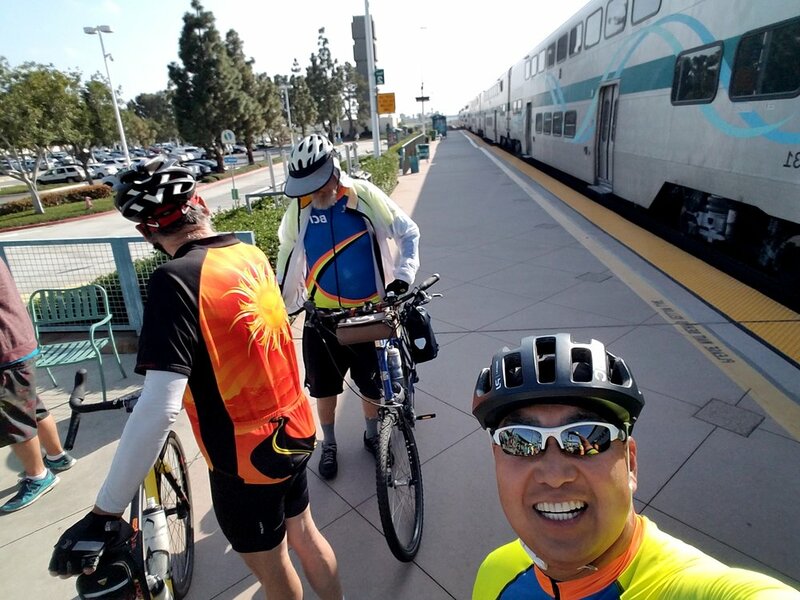 Most of Irvine has plenty of wide roads where it is easy to ride as far to right as practicable, or in a bike lane, but if you ride into Tustin, Orange, Santa Ana or Laguna Beach - or some where pretty out of town, it becomes more dangerous to invite close passing by hugging the edge. "Some just don't understand why some of us avoid edge riding & ride in the lane. If you are not willing to take a class & learn how to ride in traffic, please take a few minutes to watch this explanation, and share it with your local police department. It was produced as a tutorial for police. Know that in California, cyclists are expected to operate on the road as they would if driving a vehicle. The ride to the right rule only pertains to when a lane is wide enough to safely share side by side. You need 4', the "3 feet for safety' law requires vehicles to give us another 3 feet, and parked cars requires us to keep 3 feet out of the door zone... so only when the lane is really wide enough for all that, plus a large semi & trailer to fit side by side, it is not practicable to ride any farther to the right than the lane controlling "sweet spot" described in this video. Of course if there is a wide smooth, litter & debris free shoulder to choose, we won't mind riding off the road on the shoulder. If there is a smooth debris and safe bike lane we'll be happy to stay in it until we need to merge for a left turn or to get clear of a possible right turning vehicle. The County of Orange has a standard for an 8' or greater bike lane. The State standard with traffic posted 40 mph or more is now 6 feet. Any sub-standard bike lane width, or door zone bike lane, or worse - has parking IN IT - can be risky and not practicable to stay in. Motorists generally will see us better in the "sweet spot" and will slow down &/or pass us safely. Edge riding as far to the right as possible, is not practicable, and invites dangerous close passes." Many of us don't do FaceBook where the video was shared but here it is - please take a few minutes & watch it! At the OC Bike Rally we had paramedics take a very experienced BCI rider in to the ER - after some IV fluids he felt much better - Last Tuesday our club ride up to Foothill Ranch was warm - one of our other most experienced club members passed out and was taken by ambulance to the ER to add 2 1/2 liters of fluid... both are recovered now but needed immediate care. Older people are more vulnerable, but even if you are young and in great shape, heed the warnings of impending heat waves and seriously consider not even riding, or taking a short version, or blow off the scheduled BCI route & ride toward the beach - but remember later when it is hotter you will be crawling back into Irvine. Hydration means drink a lot of water before you need it - if you are thirsty it's already too late if you need to keep riding. Drink a full bottle of water on the way to the park before the ride, fill up & sip constantly as you ride. It's not just the sweating that will take you down, it is mostly evaporation from breathing hard while riding, and the movement through the air drys off your skin so fast you don't even know how much you are sweating. The worst is that you begin to get loopy and won't know when to stop; so look out for each other - your biking buddy may be suffering & you could be a life saver so look out for each other! Interestingly, medical science really does not know exactly what causes muscle cramping. There are lots of theories about it and many ways to help avoid them, but no one really knows exactly how or why they occur. Here are some thoughts about keeping cramps in check. Many is the century rider who thinks that drowning themselves the day before a long ride will benefit their hydration and help stave off cramps. This is not really correct. Getting enough water for a long ride does not start the day before the event. In fact, many Americans are dehydrated; we are not drinking enough water! So how much water should you consume each day? A good rule is to drink a ounce of water for every two pounds of body weight...every day. So for a 200 lb rider, that would be 100 ounces of water, or eight 12-ounce bottles of water, every day. Nutritionists say that you will know you are well hydrated if your urine is straw-colored (light in color). And this practice should be followed each day, every day, and not just during race or event week! When you are on the bike, you generally do not need to consume more than about 24 ounces of water an hour. Forget about trying to replace all the fluids you are losing during a ride. The body loses water through respiration, perspiration, and urination. If you consume too much water, generally more than about 28 ounces of water per hour, you can fall victim to Hyponatremia, commonly called Water Intoxication or Water Poisoning. This is a bad thing. Simply stated, Hyponatremia is a potentially fatal disturbance in brain functions that results when the normal balance of electrolytes in the body is diluted and pushed outside safe limits by over-hydration. Under normal circumstances, accidentally consuming too much water is exceptionally rare. Water intoxication in normal individuals can be the result of long bouts of intensive exercise during which electrolytes are not properly replenished, yet huge amounts of fluid are being consumed. Sound familiar? In general, I usually consume about 20 ounces of water an hour while on the bike. During my toughest hot-weather events, I have upped water consumption to 28 ounces an hour and consume fairly large doses of electrolytes each hour. During the Traverse MTB race several years ago, the temperatures on the Main Divide reached 117°and we were fully exposed with no shade. I was taking the maximum dosage of Hammer Endurolytes (an electrolyte capsule) and consuming about 26-28 oz. of water an hour. No cramps. No dehydration. Most water bottles are between 21 and 24 ounces, so one bottle an hour is about right. Don’t drown yourselves! Now, onto Electrolytes. Stated simply, electrolytes are critical for nerve and muscle function. Both muscle tissue and neurons (nerve endings) are considered electrical tissues of the body. Electrolytes help conduct electricity in the body. Muscles and neurons are activated by electrolyte activity. Muscle contraction is highly dependent on the presence of these electrolytes and a deficit will usually result in severe muscle weakness or muscle contractions, AKA cramps! Taken to extremes, serious electrolyte disturbances caused by dehydration or over-hydration can result in cardiac or neurological complications and unless treated properly and rapidly resolved, can result in a medical emergency! From a physiological perspective, the primary ions of electrolytes are made up of Sodium (Na), Potassium (K), Magnesium (Mg), Chloride (Cl), and Calcium (Ca). So, read the labels and make sure that you are getting a well-balanced compliment of electrolytes. I usually take electrolyte capsules, adjusting my intake up or down based on how my muscles feel. Do not rely on sports drinks to provide enough electrolytes. If you look at electrolyte content in some of the most popular sports drinks, you would need to consume 50 to 80 ounce an hour to get enough electrolytes into your system to see any benefit. This is why I like tablets or capsules. I rely on Endurolytes or Endurolytes Extreme by Hammer Nutrition. These are made in capsule form. Hammer has other products, but capsules let me adjust electrolyte replacements up or down quickly. One more thing: electrolytes are not magic potions and will not take the place of proper training. But not maintaining proper electrolyte balances even in fit athletes will have negative effects. It has been a while since I have communicated with you all online. I'm not the greatest computer communicator and I get to see most all of you on our Saturday and Tuesday rides so I keep in touch that way. And of course Bill Sellin does such a fantastic job of keeping everyone informed of ongoing events with his bi weekly alerts so everything that needs to be communicated gets out there. However, today I need to make an announcement to everyone in the club regarding a major change in our statistical membership records. Effective immediately, we will no longer be maintaining mileage statistics for members. This was decided and voted on at our June 28 Board meeting after discussion at the last two board meetings. Our reasons for this decision are as follows. First, the maintenance and recording of this information is extremely tedious and time consuming. The statistician must go through every sign in sheet, look up each individual, and record their ride mileage. That can be anywhere from 8-12 sign in sheets a week, including remote and special rides. Each sign in sheet can have up to 25 names on it The number of individual entries could conceivably be close to 200 in a week. Now granted, about 50% of the members opt to not record their mileage and check the no box, so that reduces the number, but still, it has to be close to 100 per week. That's a lot of work for one individual, especially on a strictly volunteer basis. Secondly, today's technology with bicycle computers, GPS, Strava, Iphones, and the like, makes the ability for individuals to maintain their own mileage records so simple that keeping club mileage records has become an unnecessary duplication of effort. Additionally, many of us do rides other than BCI rides. I ride 3-4 times a week, and usually 1-2 are BCI rides, so my actual accumulated mileage is not going to be anywhere near what BCI records show. Please make sure you continue to sign up for your rides. That is still a requirement. All the signup sheets will be maintained and kept for insurance purposes. You must sign in to ride. Now what that also means is that rewards and announcements at our BCI banquet for the most mileage categories will be discontinued. Since about 99. something % of our riders never qualify I don't think that will a significant loss. Not all riders keep track of their mileage and those who do know what they have accomplished in terms of their individual goals, and their personal recognition of their accomplishments is what really counts. Also, on this subject, we will now be focusing on re-defining the Statistician Board Position. There have been several suggestions and ideas that will be explored and discussed that will improve and add to the offerings of activities to our members, and we will keep you all aware of what we come up with. "From my perspective, every rider in the club is an unknowing contributor…whether they ride one day a week or five. Green, yellow, or blue. Tandem, or wheels for speed. It is the matrix of these unique riders that shall in some way impact someone else’s riding life…big or small. We throw a stick, we find a teacher. I have learned so much from many. And it is because of these riders who come each time to ride (if even just to ride) that we have such a club. Now isn’t that a wonderful thing?!! :-))"
In that simple statement Desiree described the nature and description of the core of our club. Thank you Desiree for your service. Thank you for your contributions to our board, simply by your presence and your input. Des and I met in BCI ten years ago and have been close friends and biking partners for all of that time. Desiree will still be an active member of our club and will continue riding with us regularly. Thank you, BCI members for your continuing participation in our club. You insure our survival simply by showing up and riding regularly. You are what we are all about. See you on a ride. While we had about 25 riders planning to go, cold drizzle and fog caused many of our riders to skip Glendora Mountain Road on May 12th. Eleven intrepid riders set off from Boulder Springs Drive in Glendora to tackle the mountain and earn their Rule #9 bonafides. The first climb to the maintenance shack was 8 miles and about 2,000 feet, with fog and drizzle all the way. From the shack to Mt. Baldy Village was only partly drizzly, but as the elevation approached 5,000 feet, the temperature dropped to the low 40s. The descent into Mt. Baldy Village was chilly to say the least. Keld Olsen and Gary Erhlich elected to go on to the ski lifts, another 4.5 miles and 2,100 more feet of climbing, while the rest of us headed to the Mt. Baldy Lodge for coffee next to the fireplace. The lodge now features wi-fi, so while warming up and drying out we checked the weather – 40s along Glendora Ridge Road, vs. a relatively balmy 60 degrees down in Claremont, the executive decision was made to ride straight down Mt. Baldy Road to get into warmer weather FAST. And fast it was, and within 10 minutes we hit warmer air and had a pleasant ride down the mountain and back to Glendora along Route 66. For the main group we finished up with 41 miles and 5,000 feet. Keld and Gary went to the lifts and back down the ridge, finishing up with 53 miles and 7,500 feet. We will try to schedule another GMR ride in hopefully better weather! At the village, Matt Braley, Jim Norman, Seth Challenger (guest) and Tom Skelley. At the maintenance schack, Jim Norman, Jeff Cheechov, Alex Lim, Seth Challenger, Matt Braley, Tom Skelley. It is with sadness that we report the death of Arline, Sheff, wife of Richard Sheff and know n to many of us as the diligent coordinator of many Savvy Cycling tours over the past years. At this date, no services are planned yet - Arlene donated her body to science. 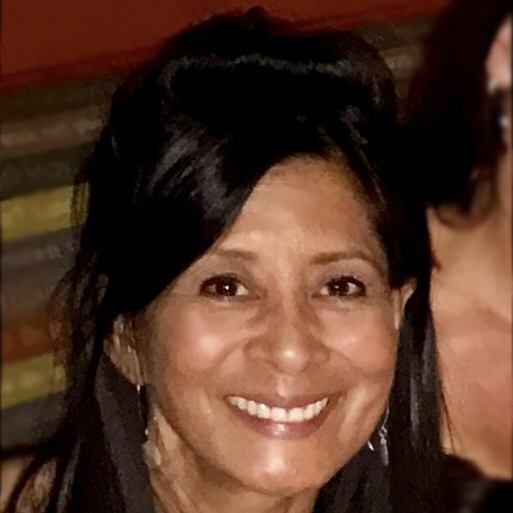 There will be a celebration of Arlene's life on Saturday, July 30th. 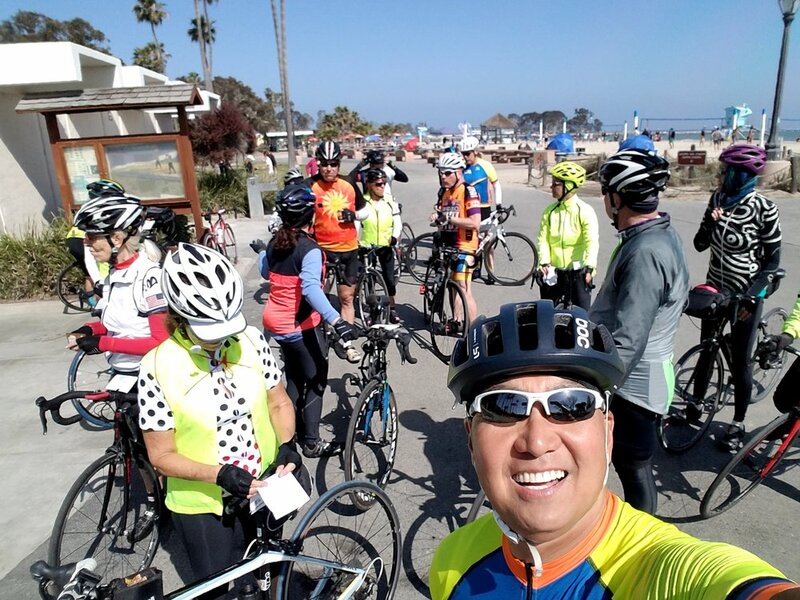 At the April Board Meeting we authorized renewing our membership in the California Association of Bicycle Organizations. This coalition of cycling advocates has been fighting for preservation of our right to ride in traffic since 1972, and worked hard to establish the state's laws on cycling with CalTrans and our Department of Transportation. The Vice President of CABO, Pete Van Nuys, is scheduled to present their recent efforts on our behalf at our June General Meeting.